I recently asked my friends what I should blog about, and the response was almost unanimous: staying fit with kids! As parents — and moms especially — it’s easy to lose that piece of your routine, but the truth is we need a solid exercise routine probably more than anyone else! 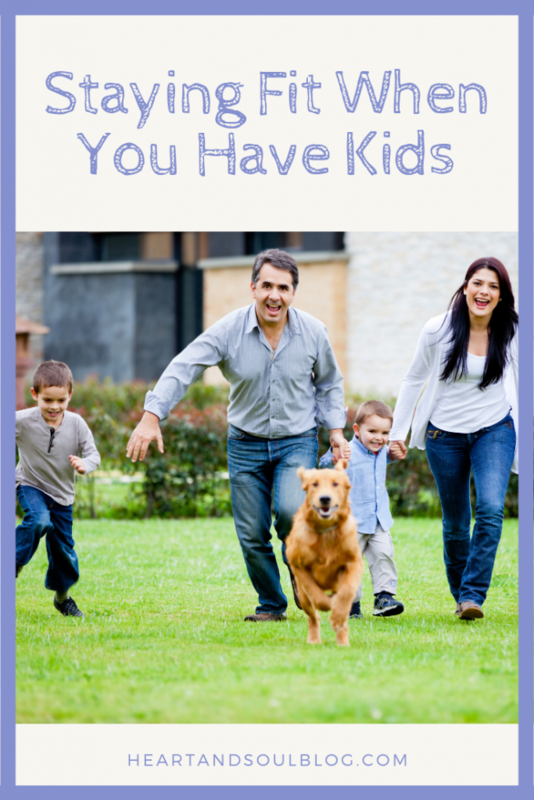 While I always have room for improvement, I’ve done a pretty good job keeping myself healthy throughout parenthood, so I wanted to share a few tips with you today. For a few different reasons! The most obvious one is that I want to live as long as possible to be part of my children’s lives — and hopefully one day my grandchildren’s, too. But also, exercise has a ton of other benefits for new-ish parents, too. Exercise not only improves your sleep, but it makes you feel more alert when you are awake. (Thank you, endorphins!) It also relieves stress, elevates your mood, and helps you regain any muscle mass lost during pregnancy. (source) If you exercise alone, it counts as self-care; if you do it with a friend, that’s social time; and if you include your kids, then you are keeping them healthier, too! Plus, of course, your kids see everything you do, so carving out time for your own health models good habits for your children. 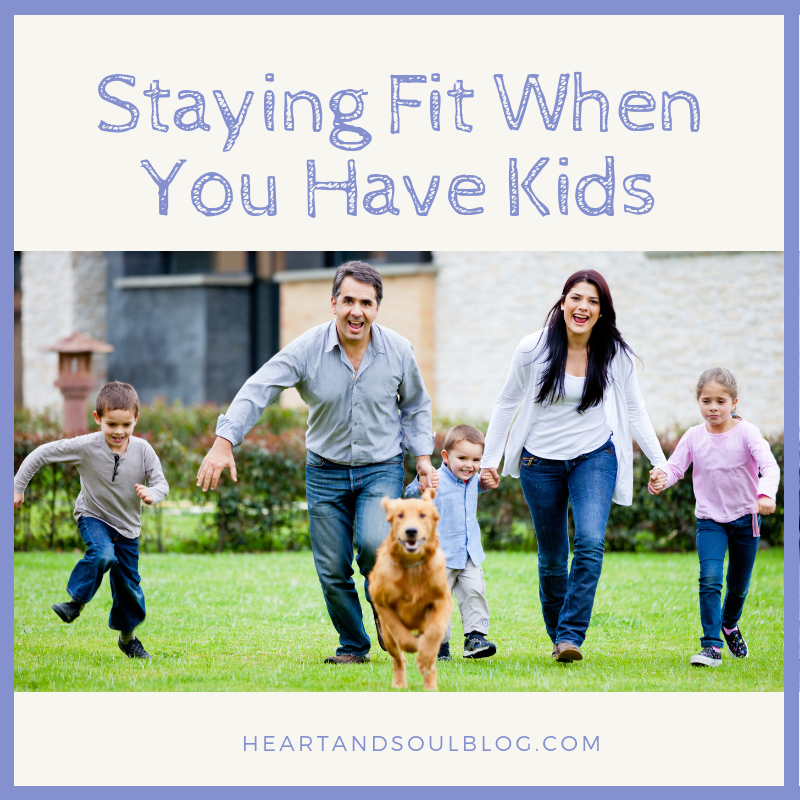 But Who Has Time for Staying Fit with Kids? Just like anything you do for your health, you have to make the time. I love early-morning exercise because it gets my day off to a positive start, and I can run or do a video while everyone else is asleep and doesn’t need me. If you have a flexible lunch hour, you could squeeze in a workout then. Or maybe you can have a regular evening class or set-aside alone time to do a sweat session then. The timing is up to you. Just commit to it and be regular! Write it on the calendar. Communicate it to your partner. Don’t let it be optional. Your health is important! Turn up some music and DANCE! My kids LOVE family dance parties. They are silly and fun and really work up a sweat. In sum, exercise is important no matter what phase of life you’re in, but staying fit with kids has a ton of benefits. I hope you will sit down and schedule some formal exercise for yourself as well as find ways to break a sweat with the whole family!